With the recent deal where Hercules Technology Growth Capital (HTGC) lent up to $30M to OCZ Technology (OCZ) for a load of warrants, investors might be better off investing with the BDC that got the sweet deal. The temptation in this scenario is to buy the low-priced technology stock hoping for a large rebound. With the BDC sector heating up, as investors are attracted to the high yields, Hercules Tech Growth Capital has mostly flown under the radar. The company provides a solid 8% yield while the investment in a public company provides more visibility than the normal unknown private firm. It focuses on providing senior secured loans to venture capital-backed companies in technology-related markets. With a subsidiary of Cheniere Energy (LNG)announcing the signing of another long-term supply contract, the stock has become overheated with a RSI approaching 80. Investors need to be concerned that the newest deal won't lead to sales until 2018 at the earliest and could face a block by the federal government. The company plans to be one of the leading domestic LNG exporters. It owns a 61% interest in Cheniere Energy Partners, L.P. (CQP), which owns the Sabine Pass facilities. Cheniere Energy Partners plans to construct six natural gas liquefaction trains that are in various stages of development to produce a total of 27 mmtpa. Disclaimer: Long SHLD. Please review the disclaimer page for more details. 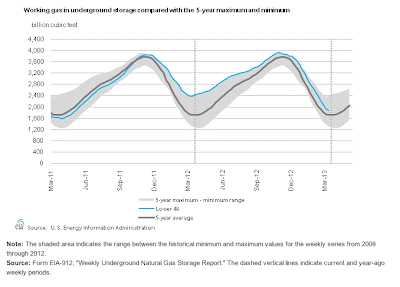 This enterprise storage maker continues to struggle as major customers pulled back on short-term orders to end 2012. This caused the stock of Fusion-io (FIO) to crater back to all-time lows below $16. The company is a leader in delivering storage solutions that accelerate virtualization, databases, cloud computing, and big data. It is a play on the trend of storage conversion from hard disk drives to solid state drives (SSDs) or flash memory. SSDs have advantages that include immediate start-up, energy efficiency, faster, and no movable parts making them less breakable. The sector is one of the fastest growing around, but the leading public companies continue to struggle with all of the stocks trading near lows. Both OCZ Technology Group (OCZ) and STEC (STEC) have had issues either with past executives or financial reporting. Disclosure: Long AAPL and short FB. Please review the disclaimer page for more details. Back in August of last year, Stone Fox Capital wrote about the continuous decline of Zipcar's stock. The stock had traded down to $6 in a steady and unrelenting decline since going public around $30 back in 2011. The stock had become so punished that it wasn't long before Avis Budget Group (CAR) came knocking with a $12.25 per share offer in cash that gave bottom feeder investors huge gains. The latest action in Millennial Media (MM) is starting to replicate the action of Zipcar. First and foremost, Millennial Media traded at the highs out of the gate and followed the path of Zipcar with non-stop declines. It's debatable which stock had the worst chart. Second, the investment concepts remained intact despite the precipitous declines. Investors feared higher competition and delayed profits in pushing the stocks to incredible lows, yet the thesis of car sharing and mobile advertising both remain strong. After trading as high as $50 in early 2011, Ctrip.com International (NASDAQ: CTRP)continues to languish in the low $20s. Even with a growing revenue base, the company faces margin pressures from online entrants to the travel market in China and a general lack of interest in Chinese stocks. CafePress (NASDAQ: PRSS)provides individuals and businesses the ability to create, buy, and sell customized and personalized products online using proprietary technologies. The company offers a unique opportunity for designers and consumers to meet in the cloud, but does the service provide any unique competitive advantage? While most investors want to play Clean Energy (NASDAQ: CLNE) or Westport Innovations (NASDAQ: WPRT) to gain exposure to the natural gas as a transportation fuel concept, the sensible way is Chart Industries (NASDAQ: GTLS). The former stocks remain highly unprofitable and very speculative while Chart continues to spin-out huge profits supplying the build out of the use of natural gas as a fuel. With rigs drilling for natural gas near record lows, one has to assume the numbers will eventually overshoot before exploration companies back any moves to increase production. Typically when the RSI hits a figure below 30 the stock is oversold. When that number creeps below 27, the stock is reaching the significantly oversold position. Not many stock go lower than 24 other than complete destruction of the stock. 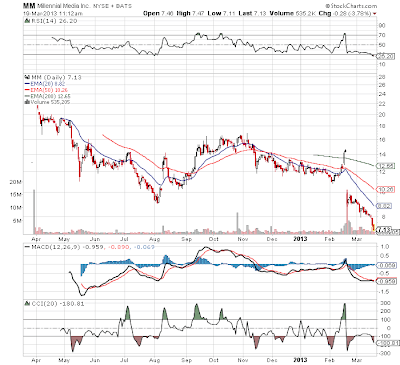 Millennial Media (MM) is trading around 26 on the RSI as the stock plunges further to nearly $7 today from $8 on Friday. Remember the stock was trading over $14 prior to earnings. Incredible to see this much destruction with revenue growing 55% this year. Traders clearly do not believe the updated guidance. The fear is that Google (GOOG) is and will eat their lunch. The secular decline of the PC market should make any investor question why Dell (DELL) should obtain a premium valuation to the LBO offer of $13.65. The company has limited traction in the mobile sectors of smartphones and tablets, suggesting the business is only getting worse, not better. The stock should've been hammered Friday on the report by David Faber on CNBC suggesting the operating income forecasts used to value the LBO will be cut. The stock though actually rose for the day to close at $14.31 and above the offer. The independent mobile advertising sector just can't shoot straight or at least thats the opinion of the stock market. Largest independent mobile ad network provider Millennial Media (MM) broke down to new all time lows today. The stock now fetches a market cap of below $600M while supporting huge growth. The company did disappoint in Q412 (see Millennial Media: When 68% Growth Isn't Enough), but one has to wonder if the punishment fits the crime. The CEO doesn't do the greatest job of explaining the situation on the Mad Money show back after the earnings report, but investors selling this stock off to new lows should take time to review it. Clearly the company needs to do a better job of containing expectations so that 68% growth isn't seen as a negative. The stock now trades at less than 1.5x forward revenue estimates. All other stocks with these growth rates trade in the 10x multiples. The media continues to focus on what Facebook (FB) is doing to monetize traffic, yet very little is focused on the traffic trends itself. The company has famously focused on the positive year over year trends, yet the sequential monthly figures tell a far different story. The leading Internet social media firm has surged to a market cap approaching $65B based on a whole slew of traffic monetization plans from mobile to graph search to gifts. While nobody disputes Facebook as the leading social networking platform, a big difference exists in whether the company is a required network for interacting or a social network soon to be replaced by newer platforms just as it replaced MySpace. With the market craving yields, it is amazing that several business development stocks can still yield around 10%. Both Solar Capital (SLRC) and TICC Capital (TICC) have had yields around 10% for a considerable amount of time. While Prospect Capital (PSEC) remains a favorite (see Prospect Capital: Prospecting For Even Higher Dividends) with a yield of nearly 12%, the question is whether either of these less followed BDCs provide a better investment? The company operates as a closed-end investment company that invests primarily in leveraged, middle market companies in the form of senior secured loans, mezzanine loans, and equity securities. The stock has a market cap of $1.1B and currently yields 9.7%. After previously writing about Fifth & Pacific Companies (NYSE: FNP)when the stock was trading around $14, the recent jump to the $19 level is worth reviewing. The stock has been on a steady rise as brand kate spade registered 27% comp sales growth in Q4 and rumors spread that the company was looking to sell positions in the lagging brands. After successful splits of Time Warner Cable (NYSE: TWC)and AOL (NYSE: AOL)in 2009, Time Warner (NYSE: TWX)is attempting another spin-off. This time the company hopes to separate the struggling magazine producer, Time, Inc. Will this spin be as successful? Demand for software companies that cater to business clients remains strong, but not enough workdays exist in a year to make Workday (NYSE: WDAY)attractive at current market multiples. The company went public in mid-October at highly unappealing multiples that left limited upside ever since. This article is a continuation of a monthly series highlighting the top net payout yield stocks that was started in June, 2012 (see article). The series highlights the best stocks for the upcoming month. Please review the original article for more information on the net payout yield concept. Disclosure: Long AMP, DTV, KSS, MSI, NLY, NOC, and WLP. Please review the disclaimer page for more details. Tesla Motors, Inc. (TSLA) continues to trade around highs even as analysts cut estimates. The company recently predicted profits for Q1 2013, yet the average analyst still expects a small loss by the company. In fact, over the last week, the Q1 estimate has slightly dropped to a loss of $0.07. The company is leading the charge to developing the electric vehicle market with several revolutionary Model S that has obtained numerous awards. While the stock remains close to the highs at around $37, the analysts continue to drop the estimates for 2013. The company reported what appeared to be strong results for Q4, so why have the analysts gotten more negative on 2013 and 2014 results? After a huge surge in February last year, Buffalo Wild Wings (NASDAQ: BWLD)has gone virtually sideways. The stock had a huge day on February 7 where it surged from $70 to $82.50 yet the next year has seen nothing but disappointment for investors. It used to be that growth stocks traded at 1x the earnings growth rate. A stock growing at 10% with earnings forecasted at $2 would trade at $20 and in some cases up to 2x that growth rate. In the current climate a stock such as Atwood Oceanics (NYSE: ATW)can trade at virtually half the growth rate. In the Q4 earnings release, Terex (NYSE: TEX)announced the goals of earning $5 in 2015. Considering the company just reported a year of achieving $1.83, the natural question is whether the company can legitimately grow earnings that fast over the next 3 years. The company is a diversified global manufacturer of equipment focused on aerial work platforms, construction, cranes, material handling and port solutions, and materials processing. A lot is made about the cash balances at Apple (AAPL). In fact a recent article talked about the cash balances not being the $137B (see Apple Does Not Have $137B In Cash) normally used by analysts. The point of the article was that Apple doesn't actually have $137B in cash, but rather the amount is in other assets such as long-term marketable securities that accounts for the majority of the $137B thought to be cash. Instead of dissecting whether the company has the cash invested into short-term and long-term securities (more on that later), the more important discussion is counting up the billions coming in the door. Apple is generating so much cash on a monthly basis that it could double the dividend without needing to worry whether the long-term securities are invested in durations of 1 year or 3 - 5 year investments. The promise of a national natural gas highway continues to be a larger than expected money-losing ordeal for Clean Energy Fuels Corp. (CLNE). As predicted prior to the earnings report, the losses will continue to flow and investors should be concerned (see Coming Soon: More Losses At Clean Energy Fuels). The company reported Q412 earnings that slightly missed analyst expectations and provided general commentary that doesn't change the profit picture much for the next few years. Per the company, it is the largest provider of natural gas fuel for transportation in North America and a global leader in the expanding natural gas vehicle fueling market. The good news is that the Cummins (CMI) - Westport Innovations (WPRT) engine needed for highway use by the long haul trucking industry appears on track for Q4 production. The bad news is that Clean Energy built 70 stations in 2012 on expectations of production by this summer. Nice discussion on The Daily Ticker regarding Facebook (FB) losing its cool among the younger crowd. Stone Fox Capital has made this argument for a while now. The usage metrics have shown that the active users in the US peaked over the holidays with the amount of users during February matching the amount back in September/October. Great discussion by Matt Nesto.... now if I could only figure out how to embed Yahoo videos. For anybody interested, I'll be hanging out at the Covestor NextInvest Conference over the next couple of days. The event includes speakers from Briefing.com, Forbes, AnglesList, StockTwits, and many more. Click on the below for more details and to register for the free virtual conference. Last week, both Palo Alto Networks (PANW) and Splunk (SPLK) released earnings for the quarter ending January that saw massive revenue growth. While both stocks had hot IPOs in 2012 and trade at what are generally considered expensive multiples, they had different reactions after their respective earnings reports. Palo Alto is a leading network security provider that competes against the likes of Cisco Systems (CSCO) and Juniper Networks (JNPR), while Splunk is a provider of real-time data analysis commonly referred to as "Big Data." Palo Alto is more focused on taking market share, while Splunk is creating a whole new market. As mentioned in the original analysis (see Two Harbors Provides Unique Residential REIT Opportunity To Pass On For Now) on the formation of the spin-off of Silver Bay Realty Trust (SBY) from Two Harbors Investment Corp (TWO) the process would initially be ugly. The combination of pulling in housing assets from two entities and being the first public company to attempt the owning and renting of single-family houses made the stock impossible to value. On top of that, the majority of the owned assets were acquired in 2012 leaving limited data on the stabilization process and ability to lease the houses. It wasn't too long ago that Heckmann Corporation (HEK) had completed an accretive merger that should've driven the stock higher. On the way to large gains, the market for environmental services has hit road bumps as demand for shale drilling has declined. Oddly though, analysts have become more constructive on the oil services stocks outside of this general area. The company is a leading environmental services provider dedicated to the movement, treatment and disposal of water generated by energy companies involved in the production of oil, natural gas liquids and natural gas. The game-changing merger with Power Fuels (see Heckmann Makes Game-Changing Merger) promised significant improvements to margins and profits, but did the owners of that company become the big winners? Disclosure: Long CJES and HEK. Please review the disclaimer page for more details.